Living in the information age has left no facet of society unchanged, and the retail industry is no exception: with endless options to choose from, shoppers are using product information to buy what they want and big name retailers like Nordstrom are taking note and using this to their advantage by providing extended attributes for each product. Simply tracking the current retail initiatives surrounding extended attributes isn't enough: it's important to share stories about real shopping experiences that demonstrate how they affect consumers' purchase decisions. This is one of those stories. I was halfway through my sun salutation when the stretched-out waistband of my yoga leggings started slipping down. As I dove into downward dog, the situation grew worse as the once-elasticized hem of my exercise top began inching towards my collarbone. Instead of focusing on my practice, I spent the next ten minutes trying to finagle my clothes into staying put. The truth was undeniable: I needed to invest in some new yoga clothes. The question is, where and what did I want to buy? 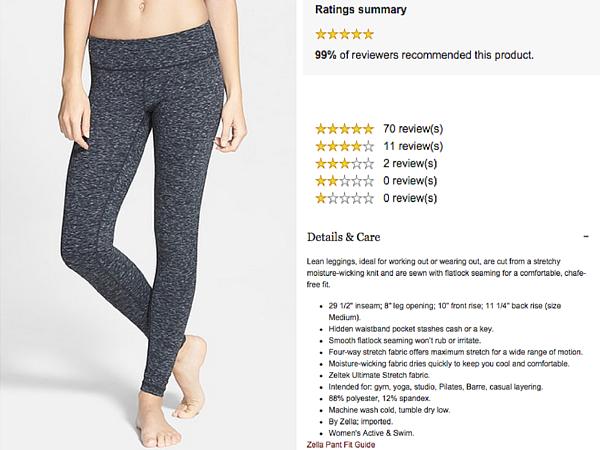 Like any aspiring yogi worth her salt, I'd spent time perusing the Lululemon website, but the idea of spending nearly $100 for a pair of yoga pants that I'd be abusing on a weekly basis was untenable. That said, after spending the past year sweating my way through vinyasa class, I knew that while cheap cotton leggings might be fine for lounging or running errands, they were no match for Yoga class. That left a large swath of middle ground in which to search. 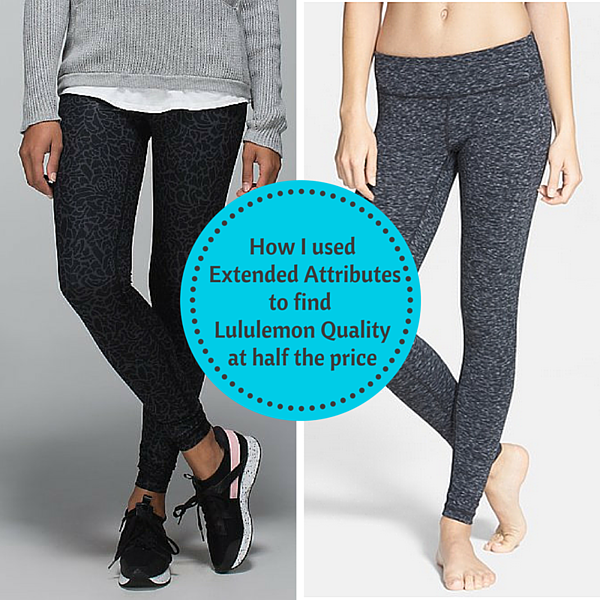 I decided to use Lululemon's extensive product attributes as a guide for the type of quality I should look for. After all, as the gold standard of yoga gear, if I could find another brand whose offerings have similar attributes (material, features, benefits) it would logically mean that the product would be of similar quality. 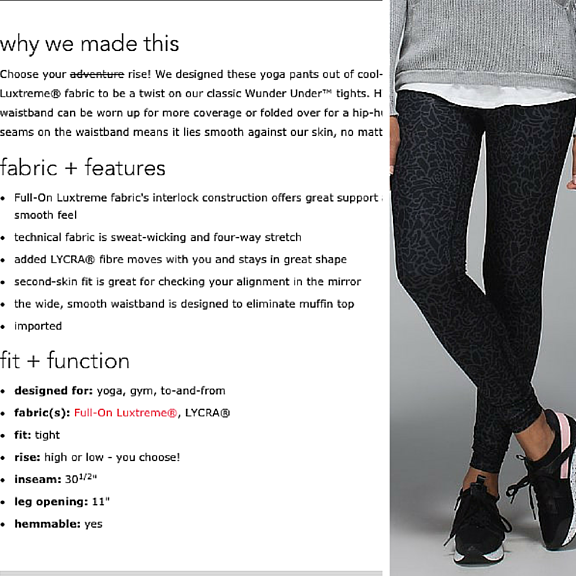 The key attributes for yoga (according to Lululemon): fabric that is both 4-way stretch and moisture wicking, interlock (i.e. flat seam) construction, and a wide waistband. The hunt was on. While I usually delight in buying things from unknown brands and retailers, activewear is one of the few categories that's tricky to buy online from a lesser known brand. There are currently no industry-wide standards that dictate the amount of product information retailers must provide, and since I was searching for new gear based on extended attributes, it was important to find a retailer or brand that provides them. In addition to requiring a high volume of product attributes, I also categorically refuse to pay for shipping unless it is absolutely unavoidable, so finding a retailer who offers free shipping was crucial. So, who ya gonna call when you want high-quality athletic apparel with lots of attributes and free shipping? Nordstrom is one of the retailers who has been working with information standards GS1, a company that facilitates industry initiatives, to create guidelines for extended attributes for apparel and accessories, so I knew that product information is something they value, and thanks to a concentrated effort to improve customer service, every order qualifies for free shipping and free returns. I typed "Moisture Wicking" and "4 Way Stretch" into the search bar on the Nordstrom website and found an array of options, but I was immediately attracted to a brand called "Zella" because it had the same bright, cheerful, modern aesthetic as Lululemon. I took a look at the product information and as promised, Zella Yoga Leggings offered the same benefits of Lululemon (moisture wicking, 4 way stretch, wide waistband, chafe-free, flat seamed construction) at around half the price. and the reviews were almost unanimously positive. I continued to peruse the offerings from Zella on Nordstrom before using Google to do a little background research. It turns out Zella is Nordstrom's own in-house activewear line, and it was created for Nordstrom by a former Lululemon product manager! Searching for yoga gear using extended attributes had allowed me to find a nearly identical product at half the price. When you're knee deep in the daily grind, awash in spreadsheets and data entry, it can be hard to remember why you do it. Providing consumers with as many product attributes as possible is key for retailers and their suppliers because it allows us to purchase new products with confidence, and feel good about paying for the product's quality instead of the logo.